✈️【ALTITUDE HOLD MODE】- Flying the drone at a specified altitude. Under this mode, you can make the drone flying in the default height and hover. More easy flight mode drone for beginners or 14 years old+ boys. 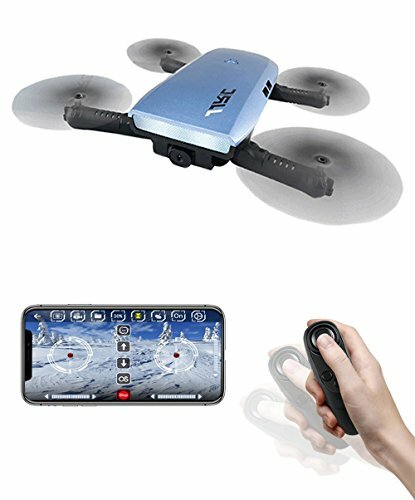 ✈️【Gravity Sensor Control】- Hold the controller and tilt it to a specific direction to fly the drone .Get a more real sense of participation more fun. ✈️【WI-FI FPV REAL-TIME TRANSMISSION】- With the 720P camera and WI-FI FPV function, you can see exactly what your camera sees with a live video on your mobile device by download the relatd APP. ✈️【360 Degree FLIPS & STUNTS】- Impress your friends and family with awesome 3D tricks with the push of a button. ✈️【PRODUCT WARRANTY】- We warrant this Elfie+ Drone 12 MONTHS from the date of purchase including any Amazon fulfilled orders which are over the return time. Any questions about the product, please do not hesitate to contact us. We will reply you with in 24 Hours.